When a soldier with a troubled past and a struggling songwriter agree to a marriage of convenience for the military benefits, neither expects much after saying “I do.” Then tragedy strikes, and the line between what’s real and what’s pretend begins to blur in this smart and surprising romance perfect for fans of Nicholas Sparks and Jojo Moyes. Cassie Salazar and Luke Morrow couldn’t be more different. Sharp-witted Cassie works nights at a bar in Austin, Texas to make ends meet while pursuing her dream of becoming a singer/songwriter. Luke is an Army trainee, about to ship out for duty, who finds comfort in the unswerving discipline of service. But a chance encounter at Cassie’s bar changes the course of both their lives. Today, August 2, at 5:34 p.m. on the South Congress Bridge, also known as the South Congress parking lot, I accepted my true form. The windows of the Subaru were down, Queen’s Greatest Hits was at full blast, and this was it, I was no longer a woman shackled to a cubicle, I was a bandleader, scream-singing with Freddie Mercury. The cars ahead were braking. I followed suit, holding out my hand to make sure the box on my front seat didn’t slide. Inside was a picture of my mom and me at Disneyland when I was five, a coffee mug with David Bowie’s face emblazoned on it, and three stale granola bars I found buried under some old depositions. My personal effects. And that was today. I had walked off the set to start my real life, hopefully one that involved not just car singing. Despite the fact that Beth’s drawn-out, fake-sympathetic “I wish I didn’t have to do this” speech had made me late for my second—now only—job, I had already realized being laid off from Jimenez, Gustafson, and Moriarty wills and probate attorneys was meant to happen. Not a blessing in disguise, not a wake-up call, but an actual pure-as-sugar good thing, a thing I had wanted and wished for: to be rid of the endless hours of licking stamps and finding typos, and, more often than not, quickly tabbing out of Hiatus Kaiyote performances on YouTube when I sensed Beth behind my desk. I switched lanes to get ahead of the Pathfinder. This was it. I would announce it. I turned down Queen, put my phone on speaker, plopped it in the cup holder, and dialed. “Yello.” Traffic hummed in the background. Mom must have been on her way home from the Florien residence, where she cleaned on Fridays. “You got fired?” she repeated. I thought of Nora’s smoky basement, of Toby swiveling on the stool behind his drum set, of pressing my ear to the wood of the old upright piano I got off Craigslist, of never having to end band practice at ten p.m. so I would be awake enough for a daily purgatory of Excel spreadsheets. I could find out what it feels like to be an actual musician. I could wake up tomorrow, and the next day, and the next, knowing the whole day was mine for The Loyal. “What about your rent?” my mom interrupted. “I’m worried,” she said, and, as if the word “worried” were some sort of password, a coiled spring released and she began to rant. I hoped she was still driving slowly. She tended to wave her arms a lot. She spoke of a severance package. The enrollment deadline for state-assisted health care had passed, she said, but they better make an exception. I waited to tell her about my full transformation as she spoke, breathing deep, trying to calm the hard, twisted kernel of worry in my stomach. I had learned to pay close attention to my stomach, more so than most people, I was pretty sure. We had to be on the same team, my gut and I, because for the past few months it’d been off, cranky. I pictured it as a wise, old, talking anthropomorphized object, like a character in an animated movie. What my gut communicated was usually limited to things like I do not care for these Flamin’ Hot Cheetos, or Good effort with the bean soup, I’m going to expand and sit with this for a while. Now it seemed to be saying everything my mom was saying, but in a nicer, less shrill way. Cassie, it rumbled, sending waves of nausea. You’re not facing reality. She was still going. “You’re right, Cass,” she said. And for a wonderful moment, we were all together, the three of us—me, my mom, and my gut. The traffic moved a whole twelve inches forward, and a breeze sailed through my open window. My gut flared again, and I avoided hitting the bumper of the Honda in front of me by an inch. I wanted to slam my head against the steering wheel. With her accent, anyone who wasn’t me would have thought she said “El Sot.” The dreaded El Sot. It wasn’t as if Mom were going to smash my Yamaha and force me to enroll in UT Austin by gunpoint, but ever since I graduated prelaw four years ago, the law school seed had grown roots. Now she could bring it back into the sun, water it, talk it into growing until it strangled me. I wanted to play music. Not just any music, but my music with my bandmates, Nora and Toby, somewhere between Elton John and Nina Simone and James Blake. It was the only thing that made me happy. But you can’t eat happiness. My mother reminded me of that every chance she got, and now that I’d lost the paralegal job, I had nothing to point to in order to distract her. “The LSAT, yeah,” I said. I took a deep breath. The mass in my stomach was taking over my whole torso. The mass had spread through my whole body, throbbing, dizzying me. This happened a lot. Like, twice a day, thereabouts. Hence the gut intimacy. I usually chalked it up to student loan–related anxiety, and tried to nail the source of this particular spell: Deeply hungry? Too full? Did I have to pee? Let’s go with hungry, I told my gut. I grabbed a granola bar and bit into the stale oats, trying to keep my head from spinning. My phone buzzed. I expected a harried text from Mom, but it was Toby. I smiled. A text on a day we didn’t have band practice? And before midnight? This was new. When the traffic stopped, I started replying, Maybe I’ll come over after work, but stopped. I’d let him wait. Toby was a tall, long-haired Cat Stevens lookalike who played a musical instrument. In Austin. He’d be fine. I was probably one of three women who received that text anyway. My phone buzzed again. It was Nora, who was working bar-back. Where are you? Traffic, I texted back. Be there ASAP. Also, whatever, Nora. I needed to show Mom I was serious. An album by The Loyal, perhaps. As yet unnamed. Maybe a color. Toby had suggested naming it Lorraine, after his cat. We’d have to record it first. The rest—the health care, the money—would fall in line after that. My gut rumbled again, disagreeing. When not producing fiction for young readers, Tess Wakefield works in Golden Valley, Minnesota as a copywriter, an amateur comedian, and a caretaker for several thriving plants. Purple Hearts is her first novel for adults. "When I laughed at loud at Tess Wakefield's wit on page three of PURPLE HEARTS, I knew this was a book I would love. With complex and compassionately drawn characters facing all-too-real problems, Wakefield has created a uniquely affecting love story about two people so deeply human you'd almost swear you know them." "Wonderfully true and surprising, with modern, complex and fascinating characters." "I found myself not wanting this novel to end. I would definitely recommend this novel to readers who enjoy Nicholas Sparks, Jojo Moyes, and other contemporary romance novels." "A good, romantic take on some very modern challenges!" "Rec it? Yes! Even though I am desperate for an epilogue, I still would recommend this to anyone who loves their brooding military hero, especially one who has worked so hard to redeem himself." 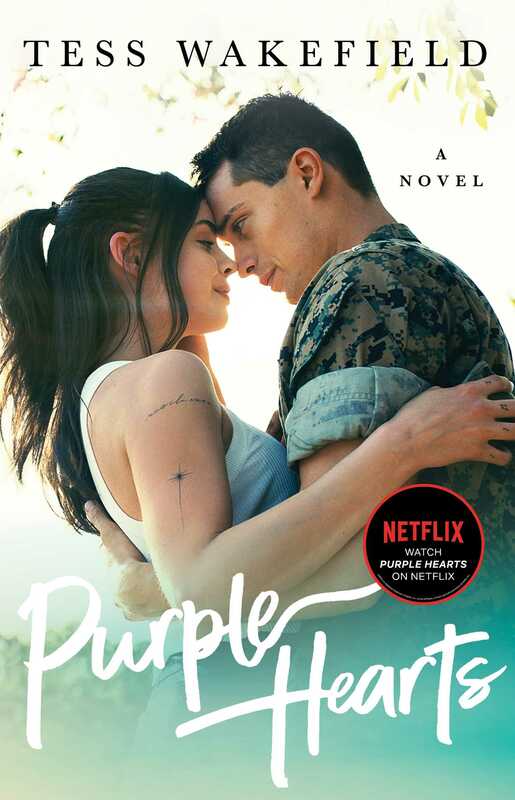 "If you're looking for a book that will tug on your heartstrings and one that is filled with an unlikely romance which will have you swooning, definitely check out PURPLE HEARTS this summer. It would be the perfect read for a lazy summer day or a relaxing day at the beach." "PURPLE HEARTS is every bit real and tangible. It's a story you can't walk away from, yet you're breaking into pieces the deeper you read. My only objection is that I wanted more. More of Cassie, more of Luke. More of their lives intertwined together. It's a slow burn, a sizzle, a spark, a big gush of wind threatening to blow you away."